Are You Wearing the WRONG Running Gear? Hi! It’s Run Camp Day 13!! How’s it going? Are you running stronger? Longer? Faster? Happier?? Do the work. Check the Run Camp Calendar and cross of each day. Use the running log. 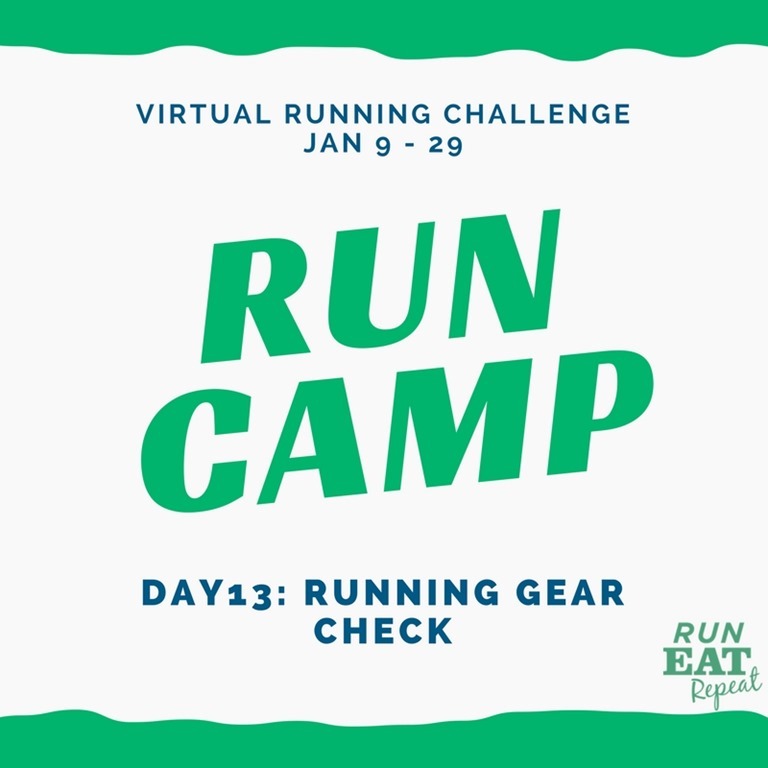 It’s only 21 days – you have to do each day’s challenge or at least check in with yourself and your training to make sure it’s the BEST plan for your running goals. Today is all about RUNNING GEAR! We talked about Running Shoes last week. 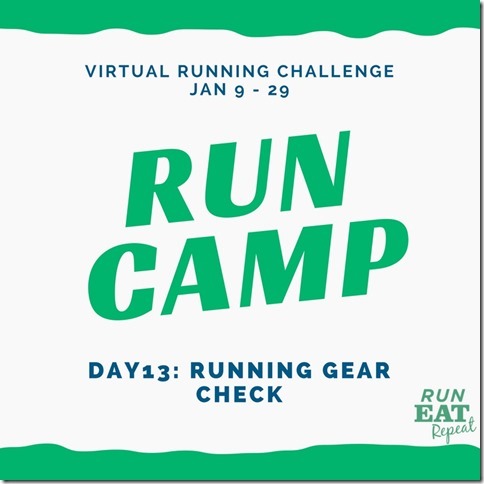 Check out the Run Camp Running Shoes post here. Running in the wrong gear can make training no fun. It can make running harder. It can make you self-conscious. It can leave chafing burns and be all around uncomfortable. You don’t need to have super expensive, high end running gear. But you do need running clothes are work for YOU. Do a head to toe check and make sure what you wear to run outside is the best gear for your needs. No -> What about it doesn’t fit? Be specific. Does it pinch or is it too tight in certain places? No –> Do you need a different size? Different style or cut? Does it leave cuts, chafing burns or other painful marks on your body? Yes –> Do you need wick-wear material? A different style/cut? Do you need Body Glide or another similar fix that’s not about the clothes? Yes –> Why are you adjusting it? Is it too short / long / tight /other? Do you feel self-conscious in it and keep pulling at it to cover certain areas of your body? No –> What about the gear is failing? Does your visor /running belt / sports bra straps need to be adjusted? Is it made for running? No –> Stop wearing it for outdoor workouts and get new highly visible running gear and/or wear a light when you run. Does it make you feel ‘like a runner’? Think about everything you wore on your last run. Does it work? Is there anything that can be changed/updated to make running a better experience? Other: Rubber bands that hold my hair in place. A good sunblock and lip balm with SPF. 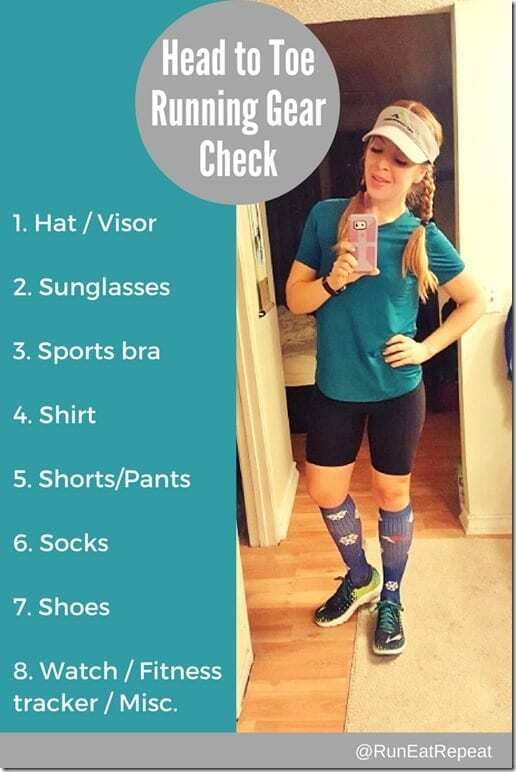 Question: Do the head to toe scan of the last thing you wore to run. Is there anything you need to change? 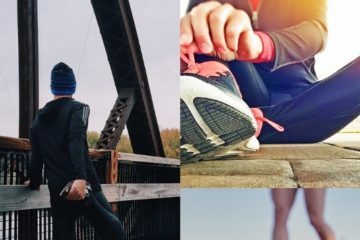 Do you carry your phone on runs? I feel like I should for safety but just haven’t come up with a system that works. So, with the cold weather here, I know my running gear will change and I know I am literally a work in progress every single time I run. I must keep my head covered because of the cold. So I wear my Patriots winter hat with every run and a lime green neck cover that I can pull up to my chin or let is slide down a little as I run. If it’s not cloudy, I have to have sunglasses and I’ll probably wear the ones I have for riding my bike if I can dig them out. I wear my UnderArmor cold gear long sleeve shirt which is also a bit of a compression shirt and helps me feel like I’m not bouncing around. I wear a t-shirt over it so I don’t look so “bleh”. I have already figured out that the leggings I wear definitely make a difference. I bought a pair at Costco last month that are lined and they seem to be best for cold weather running. They don’t slide down my waist while I’m running and they are warm. I bought Adidas Compression socks and wear them every time. I don’t run long distances yet, so they work. I’m, not sure if I’ll keep wearing the knee high socks when it warms up. I do need new running sneakers. If I’m running after dark, I have two different flashing lights. One I wear on my arm and another I can wear on my pants, which faces either front with a white light, or back with a red light or red blinking light. And I have glow in the dark reflective straps so people can see me. I felt like I needed to change my shirt during my run yesterday. It was jumping around my hips having my belly uncovered, so annoying. Do you wear compression socks for every run? I’ve been contemplating about getting a pair, but they are SO expensive! My leggings chaf, as I realised after reading your post a week or so ago. I still have yet to get new ones!